Electronic Kit School. - In electronic field there are many project with simple and expert circuit to protect the circuit from dangerous. The safety circuit usually build using IC and also transistor with it's all advantages. In here we will show you one of the simple low and high voltage cut circuit using two transistors that control the relay on and off. The circuit mentioned look like shown in Figure 1 below. 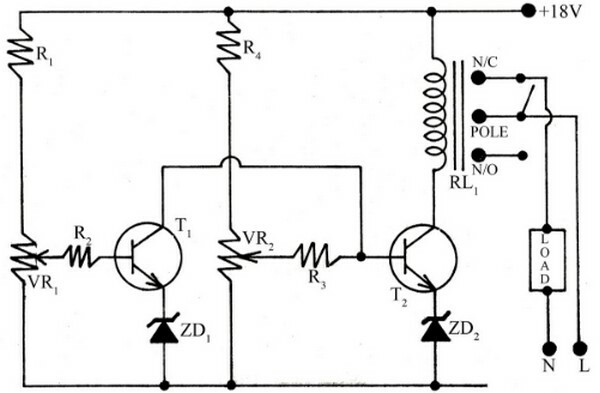 The main component to build this circuit are two transistor type NPN which popular today. In this time, beside we will show you the circuit, here we also will show you component part and global description about this circuit. Circuit like in Figure 1 above show you about the simple low/high voltage based on transistors. From Electronicsproject site describe that the entire circuit is build using only two transistor and very few other component. The two transistors are used to drive relay. Transistor T1 and T2 cut the supply in high and low voltage respectively. Variable resistor VR1 and VR2 is used to adjust the high and low voltage. As we know that when zener diode is connected to emitter of transistor then it get back bias voltage. The variable resistor VR1 and VR2 is so adjusted that it does not connect the transistor T2 and T1 in high and low voltage respectively. The load is connected through relay RL1.